[Discussion] Mi Pad 4 ? Worth to buy ? Where ? [Discussion] Mi Pad 3/4, Huawei Pad M3 or Samsung Galaxy Pad? [Q&A] system bugs, how to remove ? [Q&A] why msg 'clear this app data' randomly appears even when no app is running? 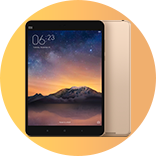 [Discussion] When will Mi Singapore bring me Mi Pad 3 64GB Tablet PC? [Discussion] Will there be a new mipad coming out soon?